Looking to fill up your iPhone or iPad with free apps? Great deals are constantly popping up in the App Store, and here are 48 iPhone and iPad apps that are now free. 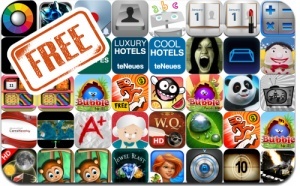 This apps gone free alert includes Cytus, Bubble Birds, Fishdom H2O: Hidden Odyssey, Vector Runner, Chicken Revolution, Dragster Mayhem, Tesla Wars, Bouncy Bug, Bubble Birds, and many others.